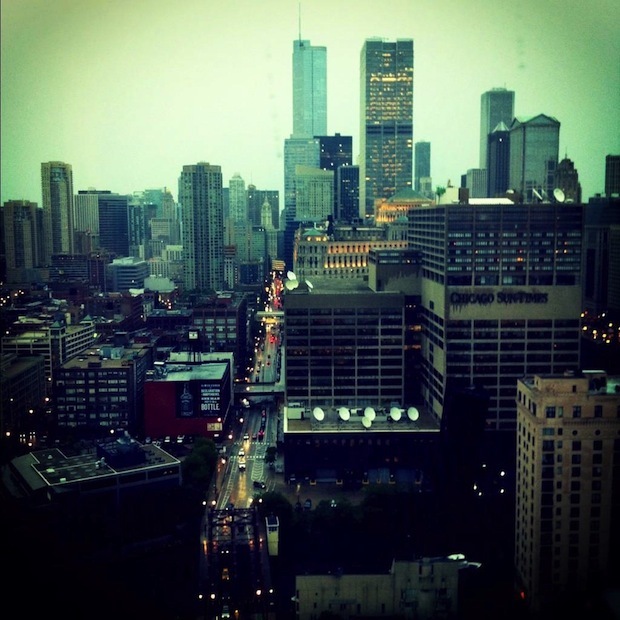 A skyline photo from the Twitter feed of BlockAvenue Chicago, a promising new neighborhood app that could be one of the first steps forward in hyper-localizing social media. Social media gets hyperlocal with apps like Block Avenue. My father has no interest in Facebook, rarely uses LinkedIn and is completely befudddled by the concept of Twitter. So when he called me the other day to rave about a neighborhood mobile app called Blockboard, I was a) honestly surprised that he even knew what an app was, and b) immediately intrigued by the concept. Blockboard began in San Francisco as a way to connect neighbors on a uniquely personal level, effectively bridging the gap between the hundreds of "friends" that we have on Facebook and the untapped support systems that exist right in our own communities. Prior to 2011, the startup was called BlockChalk and consisted of mostly neighborhood alerts, similar to a mobile Craigslist. Now under the umbrella of Klout, which made its first-ever acquisition by purchasing Blockboard this time last year, the system is rumored to become much more streamlined and social media-friendly in 2013. When you download the free iPhone app, Blockboard will recognize your location via GPS and suggest neighborhoods for you to follow. Once you&apos;re plugged in, you can interact directly with your neighbors or contact your city government about hyperlocal issues such as graffiti, trash, potholes, vandalism, etc. "Neighborhoods are more emotional than physical in many ways," says co-founder Stephen Hood, "So although Blockboard will suggest which neighborhood we think is yours, it&apos;s up to you to choose." Blockboard hasn&apos;t reached Chicago yet, but another buzzworthy neighborhood app called BlockAvenue is already making the rounds. What began as community startup in Cambridge has since spread nationwide, allowing locals to connect, share ideas and discover communities block by block. The @BlockAve_Chi Twitter account has accumulated over 1,300 followers in just a few weeks time, and their trending numbers are growing exponentially by the day. Some neighborhoods are taking the idea of hyperlocal connections one step further, creating mobile apps that specifically represent their individual communities. For example, the DUMBO region of Brooklyn (an acronym that stands for Down Under the Manhattan Bridge Overpass) is now the first neighborhood in New York City with its own app. As a devout Logan Squarian, I hope that my neighborhood will soon follow suit. Growing up in a wealthy area of North Dallas, I existed in a bizarrely insular microcosm where neighbors exchanged subtle glances across perfectly manicured lawns, but never spoke a word of greeting to each other. I lived next door to the same people for 18 years, never knowing a single thing about them. This culture of seperateness was considered normal, and to be honest, I never gave it a second thought. My life in Chicago couldn&apos;t be more different, and I&apos;m grateful for it. Now that I live in a tiny three-floor walkup and know all of the tenants in my building by name, I find the whole idea of mystery neighbors to be strange, slightly scary and even sad. I feel my heart sink a little whenever I see the same people riding the train day in and day out, heads buried in their e-books, refusing to look up or even acknowledge one another. When did avoiding eye contact with strangers turn into a total aversion of community and denial of basic human interaction? Neighborhood apps provide an invaluable public service: bringing people together through social media, as opposed to driving them even further apart. Will community-based startups like Blockboard and BlockAvenue soon eclipse Facebook and Twitter as our go-to sources for hyperlocal news? With the loss of EveryBlock still fresh in my mind, I certainly hope they&apos;ll be here to stay. Since Twitter is still a thing (for now), you can follow me @leahkpickett.